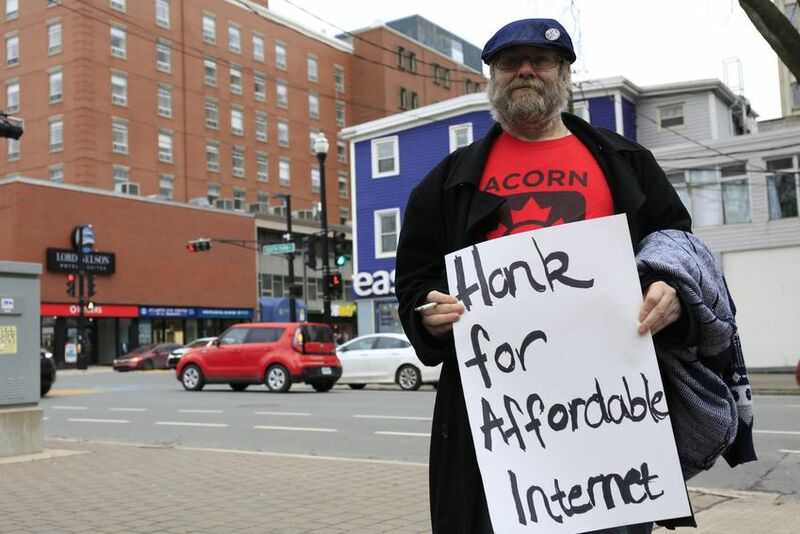 HALIFAX—A small group of anti-poverty activists took to the streets of downtown Halifax on Saturday, urging Canadian telecom giant Eastlink to offer more affordable internet, as many of their competitors do. ACORN (the Association of Community Organizations for Reform Now) has been advocating for low-income internet service across Canada since 2013 with a campaign called Internet for All. The local ACORN chapter organized a rally for the start of the holiday season to make a cheeky statement about Eastlink’s response to its demands. “They claim that they’re not big enough, they don't have enough money, enough resources to help out,” said Sarah Byrne, chair of the Dartmouth North branch of ACORN. “So we're having this rally — a mock food drive — to show them our community spirit, help raise food for them for Christmas. That’s what the community does, and maybe they can recognize that and return the favour,” she added. Byrne and a few other ACORN members marched along the sidewalk outside Eastlink’s Spring Garden Rd. store on Saturday afternoon with signs demanding $10 internet service. One poster read, “Honk for affordable internet,” which many drivers did as they passed through the busy intersection. Nine internet providers have since agreed to offer discounted internet to low-income Canadians — Eastlink is not one of them. “We hope that you will take your social obligations into consideration and opt into the federal Connecting Families program or create an equivalent program,” Byrne wrote in a letter addressed to Eastlink CEO Lee Bragg, which she intended to deliver to the Eastlink store after Saturday’s rally. Eastlink was aware of ACORN’s stance, having met with Byrne and heard her arguments prior to this weekend, but said it couldn’t do what the group wanted. “We understand that (ACORN) is not pleased with our decision, and we have tried to explain our position and the reasons why we are not participating in this federal program,” said Eastlink spokesperson Jill Laing in an email. “We don’t take decisions like these lightly. In this case, as a provider serving primarily smaller towns and communities, selling service at below-cost rates is not an option for us, given the significantly higher costs of serving smaller communities,” she added. According to Eastlink’s website, it is the largest privately held telecom company in the country, with at least half a million customers from coast to coast. Its headquarters are in Halifax.